The Business Center was part of the multi-million dollar renovation of the Lower Level of the Community Center, finished in late 2016. 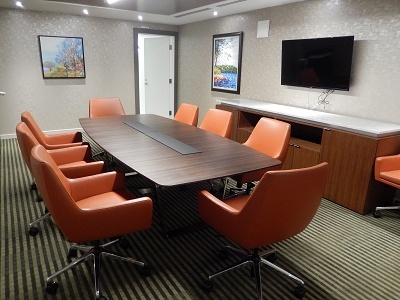 Complete with a conference table and 10 rolling leather chairs, the room also features additional seating and a wall-mounted TV for presentations. There is also a small kitchenette that features a microwave, small refrigerator, and sink, which can be closed off by glass doors. The Business Center is now open for Individual Use. Simply go to the Front Desk, provide your Rotonda ID, sign in, and staff will give you the key to the room and password for the computers. The Business Center can also be reserved for Exclusive Use for meetings or work purposes. Just call or email the Front Desk with your preferred date and time, or send a request through BuildingLink, the same as you would to reserve an Activity Room. There is a deposit and a non-refundable fee required. Hours: 6:00a.m. - 9:00 p.m.